Sound is vibration. Audio sys tems are primarily vibration generators. Many parts of an audio system are very effective vibration detectors too. The problems were explored in part 1 or our vibration control Odyssey in 2004. A moving coil loudspeaker is an effective microphone, being a diaphragm attached to a coil suspended in a focused magnetic field. A loudspeaker cabinet vibrating sympathy with a sound field can be detected by the drive units connected to a microphone input can also generate a further tiny signal. Fortunately the impedance relationship between driver coils and amplifier outputs usually renders this irrelevant. 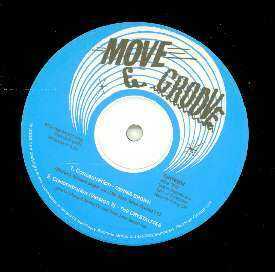 Obviously electro-mechanical devices such as Loudspeakers and turntables will be subject to the effects of vibration. Most loudspeakers work (except unusual technologies like plasma tweeters) by shoving something back and forth in the air to vibrate the air molecules sufficiently for those air molecules to vibrate their neighbours until some vibrating air molecules vibrate the listener's eardrum. Hence the mechanical air shoving system needs to be in a defined position in space, otherwise the loudspeaker output will have a tendency to generate intermodulation distortion as the loudspeaker vibrates in space. This is the primary reason for the popularity of tight position control via tiny high pressure contact patches at the tip of a spike. It is also why 4 or more spikes will always be inferior to 3 spikes. Where loudspeakers must be positioned on flat surfaces (mixing console tops for example) it is more important to protect the mixing console panels from the loudspeaker vibration than obsess about pointy contacts. Here large area absorbent mats offer the best compromise between vibration decoupling and loudspeaker position in space. Similarly, despite popular audiophile mythology, a wall proximity aligned loudspeaker will usually achieve more of its potential on a loudspeaker wall bracket that is masonry bolted to a solid wall may outperform a loudspeaker on a floor stand on a wood suspended floor; similarly a loudspeaker stand on a solid masonry floor will be better than than a bracket on partition (or drywall), which is where the floor is better than wall notion became established. Whether on a sand filled steel framed table, or on Something Solid XR4 rack or the Origin Live Ultra wall shelf, turntables benefit most from the correct support and vibration control. Every turntable type (high mass solid plinth, lightweight subchassis, heavy subchassis, lightweight direct drive) requires a different approach. A whole article would not begin to cover the field. Plenty of rigorous research has demonstrated that signal devices with gain are prone to vibration distortion effects. In particular valve amplifiers are strongly affected; their active devices work using wire mesh, heating elements and flimsy electrodes. These are effectively the components of a microphone. Airborne and structure borne vibration will be detected and amplified by valve (tube) gain stages, which owners can clearly demonstrate using a sine wave recorded through the amplifier while the amp is being bombarded with music from another source. The music will be clearly audible on the recording along with the highly distorted effects on the sine wave. "But what about solid state amplification?" challenge plebs, stage left, "Surely that’s impervious to vibration"
Even the printed circuit boards (especially in ferrous cabinets) will respond similarly microphonically, whether electromagnetically or capacitively (depending on construction), because amplifiers are devices with gain indeed stuffed with devices with gain. It is easily measured, along with any effects of further vibration from the environment. The effects of vibration on amplification equipment are more obvious (and detectable in blind tests) than any interconnect cable effects. The shelf or table begins the process of either vibration isolation (if well designed and well chosen) or of providing another opportunity to allow destructive vibration effects. Tables with 4 points of support per shelf start immediately at a disadvantage. One or two point will always be under less pressure, or even rock or chatter than the two slightly higher points that define an axis. It takes 3 points and 3 points only to define a plane. Some products like the Something Solid range, approach the problem more laterally and support the shelves flexibly. As noted in our TNT-audio.com vibration control experiments (below), electro-mechanical devices need stability plus vibration absorption; the transducer elements need defining in space accurately to preserve information (cd players, turntables, traditional hard disc drives) so these are a good place to start experimenting. CD players bombarded with high intensity sound have been shown to lose data at first (increasing interpolation rates) and ultimately skip or shut down. Fellow TNT scribe Maarten effectively improved CD players with Dynamat Extreme car panel dampening mats. 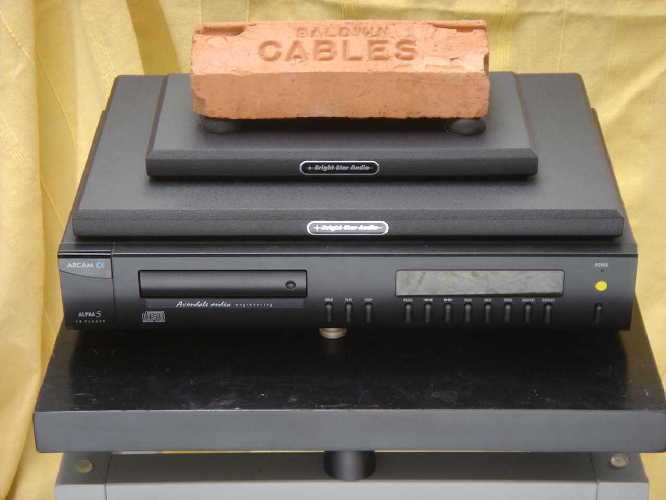 Experiments have shown that a mixture of approaches works best with CD/SACD/DVD players, of point contact under either mains transformer or CD transport axis with absorbent support elsewhere to tame chassis resonances. The no longer available PolyCrystal Isolators remain the reference (at the time of asking RDC did not accept a review offer but were tried and were not as good) and TNT-Audio's own Stone Blocks are excellent in the solid support role and another DIY solution is in preparation. BrightStar Isonodes remain the blobby reference (Deflex/Spectra Foculpods did not respond to a review request) and there will be a DIY alternative soon. Vibration control takes many forms Previous investigations (see below) indicate that different components require different strategies. Terms like coupling and decoupling are routinely misused in audio writing about vibration control. semi-rigid decoupling/coupling combinations, or those products that try to combine approaches into one device. One of the most vibration prone devises available for test is the Canor TP306 VR+. Even though there is some kind of compliant grommet between the steel chassis and the signal circuit boards, the effects of airborne vibration are clearly audible as microphony, and structure borne sensitivity is so high that some shelf types can be identified blind. 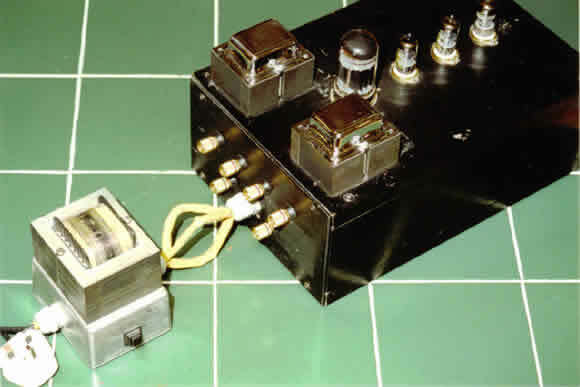 However, it remains one of the greatest single-ended phono stages ever produced, and the big bottle 6SL7 and 6SN7 valves are responsible for this microphony as well as their advantages; octal base valves (tubes) tend to be more microphonic due to their larger internal structures than b9a based valves, but the smaller valves tend to suffer from more internal crosstalk due to the proximity of the two triode sections. The Canor TP306 VR+ only shows its mettle when appropriately supported by a combination of isolation products. The execution could certainly be better designed to isolate from vibration, but this phono pre-amp remains a benchmark, although watch these pages soon for a serious contender. The inter-relationship between components and vibration control is brought home sharply by the differences between two single-ended triode amplifiers and the different valves tried in one of them. In that first article for TNT-Audio, Box Clever a Tim de Paravicini circuit design was shown built into a Russ Andrews Torlyte box. The mains transformer stands on 3 BrightStar Isonodes to isolate the circuit and the output transformers from any mains transformer vibration and the Torlyte box is fairly impervious to support, seeming to work best on Yamamoto PB9 & PB10 feet. The modified Assemblage SET300B (Sonic Frontiers derived design), fitted with EAR feet works better with large BrightStar Isonodes when fitted with JJ Meshplate 330b valves but with Yamamoto PB-20/PB-21 - setting bases when running Western Electric 300b valves. Many of the major componants submitted for review have sounded better with their lids removed or with Vibration dampening devices installed. Vibration control in audio systems is essential to exploit any of the potential of expensive audio components. Every component in the system benefits from correct choice of vibration isolation and vibration control products. Whether these be products to dampen vibrations present in the audio device, or products designed to isolate the audio hardware from vibration from external sources (be they structure borne or air borne) judicious use of vibration isolation and control will have a profound effect on audio system optimisation.